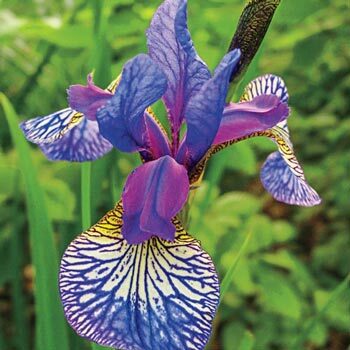 Gorgeous iris boasts a unique color combination that brightens the mid to late summer garden. Its striking white falls have blue veins and a yellow base while its standards are brilliant cobalt blue. 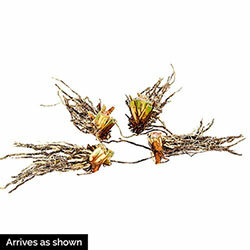 Its swordlike, gray-green foliage adds year-round interest. Shaker's Prayer Siberian Iris is an exquisite iris for planting along streams, at the edge of ponds and in naturalized areas. It's also elegant and eye-catching in cut floral arrangements. Siberian iris prefer moist soil, making them a favorite for water gardens. Their grasslike, strappy blue-green foliage remains attractive throughout the growing season. This iris grows best when planted in full sun to partial shade. Soil Requirements: Well-drained, moisture retentive soil.